Wallpapers are actually a really easy and cost-effective way to redecorate your bedroom without too much fuss, especially if you want it done quickly. They are great to make an awesome feature wall or even just for anything so get ready to read on about these stylish wallpapers you can use in your bedroom. This is a really soft and airy looking wallpaper that would look really fresh with its minty blue colour set against a white background. The rest of the bedroom’s decor complements the wallpaper as well for a seamless look. Putting up this amazing wallpaper in your bedroom is guaranteed to make it look super luxurious due to its gold metallic leaves that really pop on a dark background. The elaborate headboard and other black and gold accents on the bed accentuate this look to make it even more elegant. Transform your bedroom into something fabulous with this stylishly colourful printed wallpaper that won’t overpower the rest of your decor. The patterns are small enough to keep it looking chic and as it is a feature wall keeps it looking sleek and pretty. Make your bedroom more fun and chic with a metallic wallpaper that will really spice things up. Metallic wallpaper is great because it bounces the light rays off differently at various times of the day so it looks like a new wallpaper every time. If you’re daring enough, go for a vivid and vibrant wallpaper that will really liven up your home, just like this quirky poppy wallpaper that makes the bedroom look extra cosy. 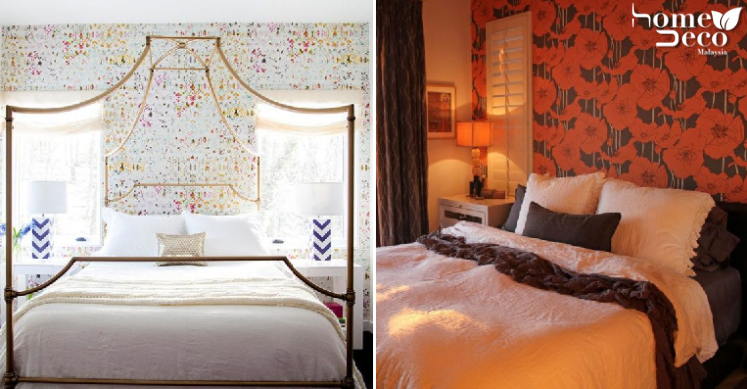 The rest of the bedroom is kept simple so that the bold wallpaper can be in the spotlight. Wallpapers don’t have to be all patterns and colours, you can use this opportunity to get some textured wallpaper and play around with it for different feels. This modern grey wallpaper looks sleek and stylish at the same time.